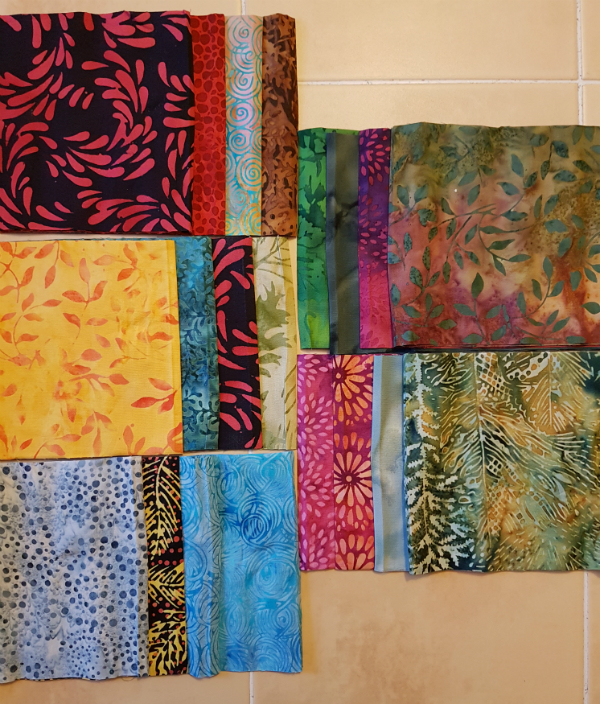 The fabrics for the project in this post were given to me by Island Batik. 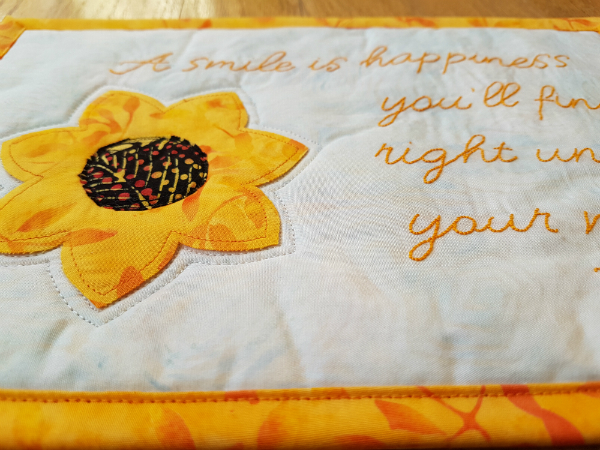 This post is very much a two-for-one 😊 When Bernie at Needle and Foot announced her mini quilt drive, Spread the Love, I really wanted to participate. How could you not want to when the quilts will go to A Doll Like Me? Amy, at A Doll Like Me, makes dolls with limb differences so that kids can have a doll that looks just like them. The mini quilts are perfect for wrapping the dolls up and giving an extra level of joy to these kids. 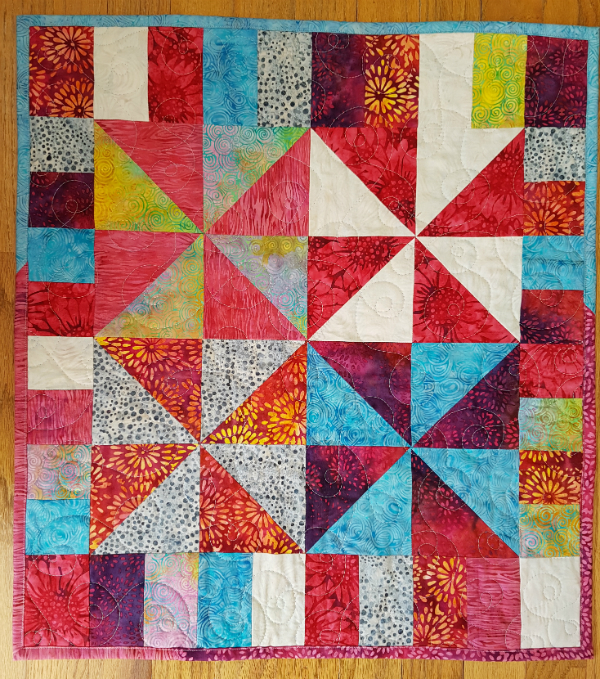 But, with a bunch of deadlines looming, I wasn't sure how I could fit in another quilt, even if it was just a mini quilt. 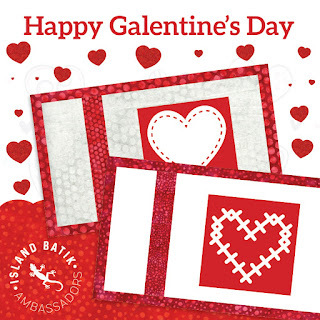 And then I remembered that the second February challenge for the Island Batik ambassadors was called Mini Love, and the task is to make a mini quilt. Make my doll quilt out of the Island Batik fabrics and it would qualify for both 😊 The funny thing is, I made two doll quilts, since it's almost just as fast to make two identical quilts as it is to make one, so I guess I did have time to make one for each thing separately. 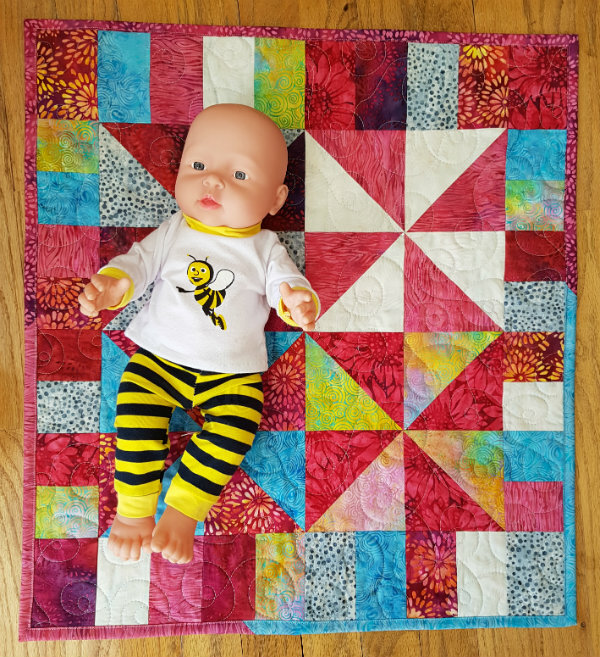 For the doll quilts, I dove into the stash builder rolls in my box from Island Batik, along with a couple of the prints from the Galentine's bundle and made these two bright, cheerful doll quilts. They're sure to chase away any dreary winter doldrums you might be feeling. Today one of the kids I babysit brought a doll, which made the perfect model. 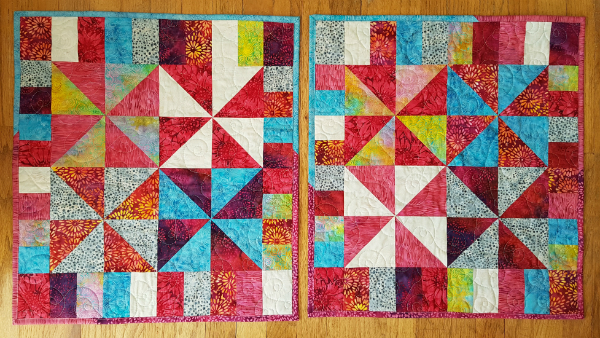 The quilts both use the same 8 fabrics, but the fabric placement is different in each one, so they're not quite identical. I worried that they'd be too wild and crazy, but I'm happy with them. I think they're perfect for kids. 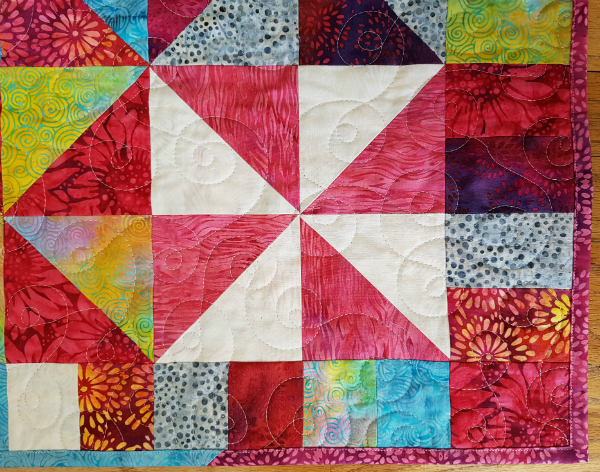 The pinwheels finish at 8". 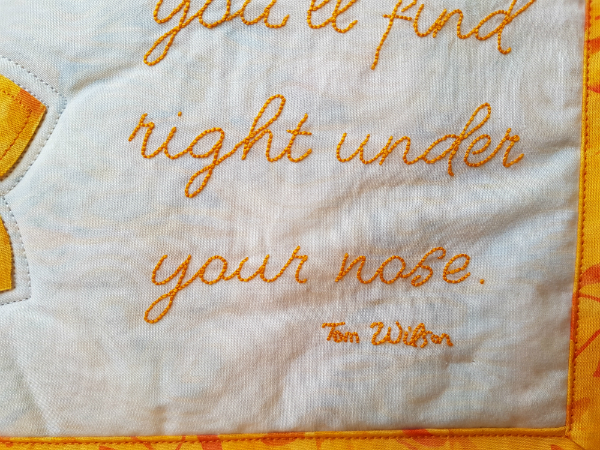 The top and bottom borders are 4" wide and the side borders are 3" so the quilts are just barely rectangular. 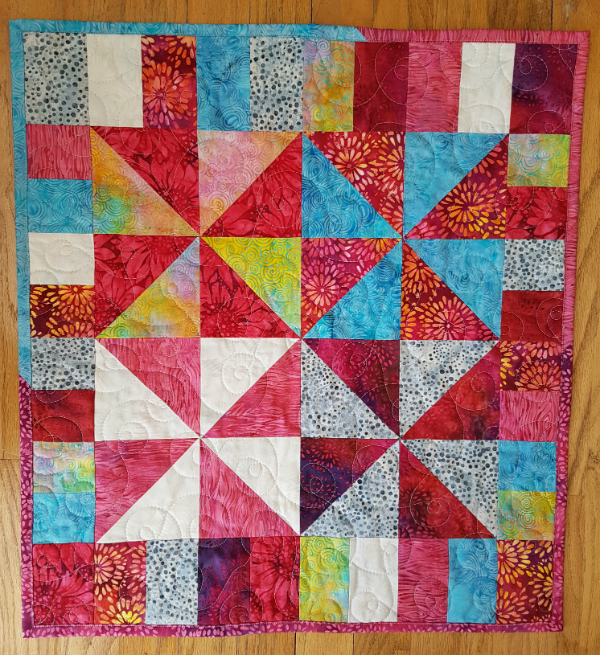 This loopy quilting has become my go-to design lately. I love the look of it and it's super quick too! 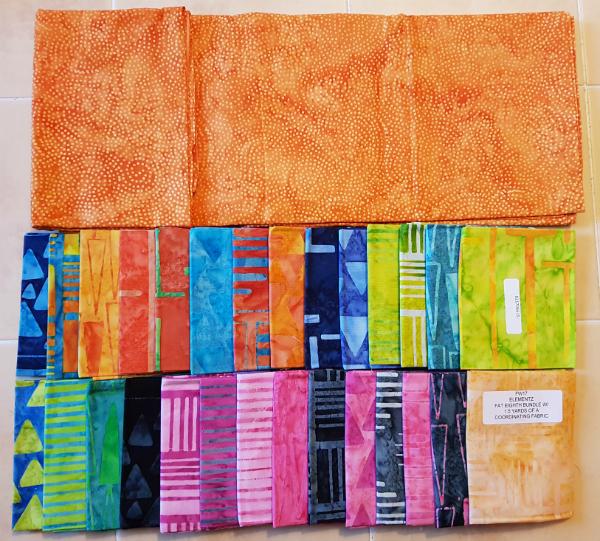 I quilted it on these with Aurifil 2600, which looks great on all of the different colours of the batiks. Thanks, Bernie, for giving us the opportunity to serve these kids! And thank you, Island Batik, for giving me such beautiful fabrics to work with. Have you ever noticed that saying 'thank you' often feels inadequate for the gratitude we feel? We hear people saying things like, "Thank you just doesn't seem like enough, but it's all I have, so thank you again." And when one isn't enough, people say, "Thank you, thank you, thank you!" While reading the book of Ruth a few weeks ago, I found a beautiful way to say thank you when 'thank you' just isn't enough. The book of Ruth is the story of two women. Naomi is an Isrealite widow. Ruth is Naomi's daughter-in-law, also widowed and from the country of Moab. When Ruth's husband died, Naomi urged Ruth to return to her own family, but instead Ruth insisted on staying with Naomi, even leaving her own country and moving to Bethlehem when Naomi decided to return to her own people. As widows with no men in the family to care for them, Naomi and Ruth had few opportunities to support themselves, but Ruth went to work gathering grain that was left behind after the harvesters passed through the fields. The owner of the field came to check on the harvest and he noticed her immediately. When told who she was, he said to her, "Stay right here with us when you gather grain; don’t go to any other fields. Stay right behind the young women working in my field. See which part of the field they are harvesting, and then follow them. I have warned the young men not to treat you roughly. And when you are thirsty, help yourself to the water they have drawn from the well." (Ruth 2:8,9). This is significant because he was offering his protection to her even though she was a foreigner. Surprised, she asked what she had done to deserve such kindness. He said he had heard all she had done for Naomi, finishing with, "May the Lord, the God of Israel, under whose wings you have come to take refuge, reward you fully for what you have done" (v.12). 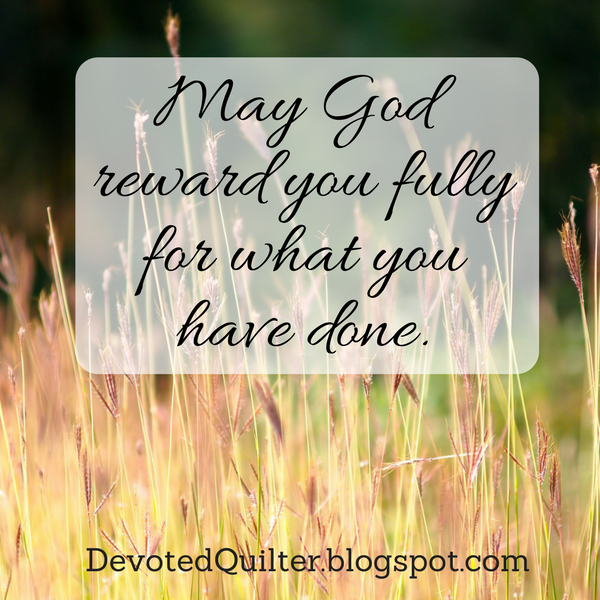 May God reward you fully for what you have done. My resources for thanking someone are finite. No matter how big the thing someone has done for me, there is only so much I can do to thank them. Only so much money to give them or use to buy them something special. Only so many cookies or other treats I could make. Only so many quilts I could give them. And as I've already said, very few words that really convey that feeling of incredible gratitude. But God's resources? They are so infinite we can't even understand them! Psalm 24:1 says, "The earth is the Lord’s, and everything in it. The world and all its people belong to him." Everything belongs to God, which means that anything is possible if we ask Him to repay people for the good they have done. There are no limits to the blessings He could bestow on them. Isn't that exactly what we would wish for them when 'thank you' is not enough? 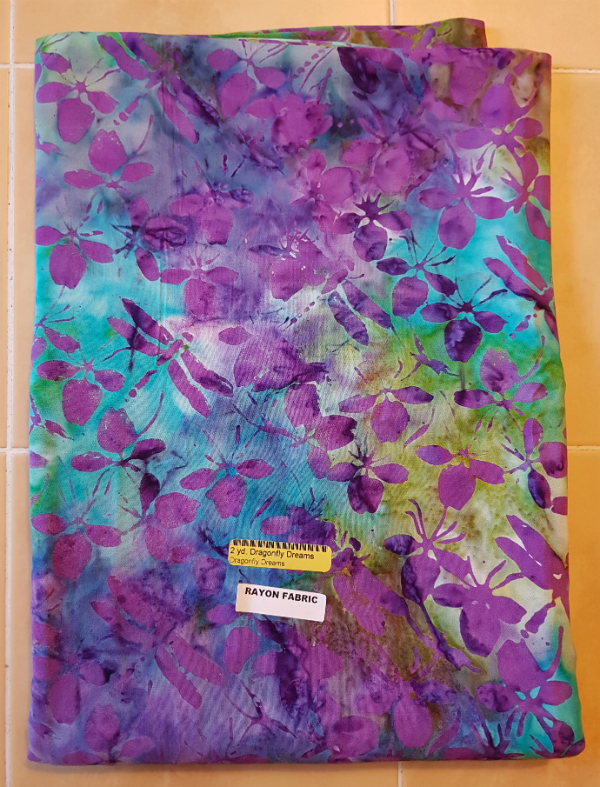 The fabrics for the project in this post were provided to me by Island Batik. 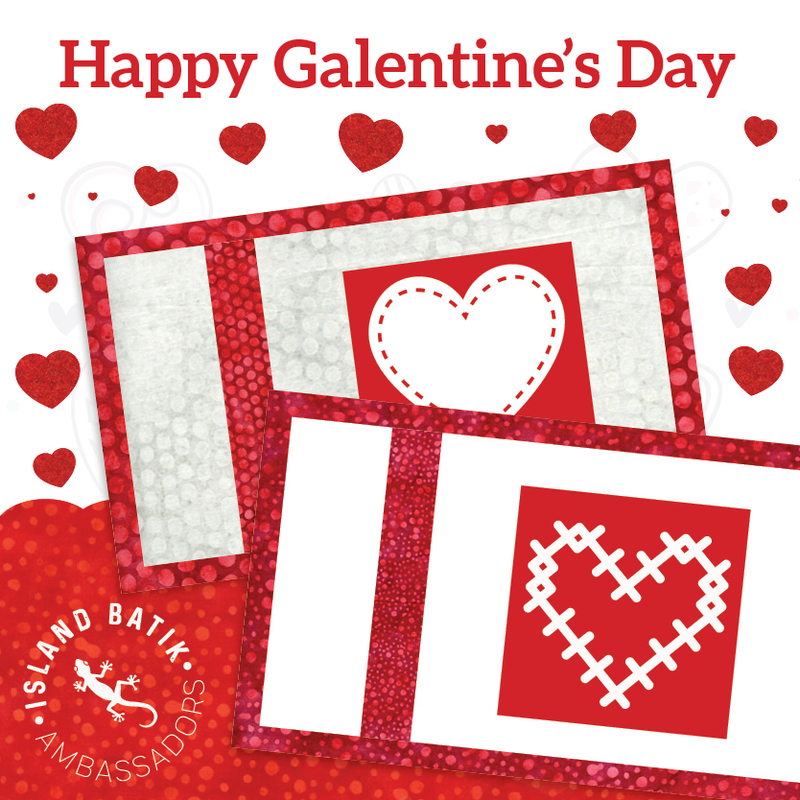 The first Island Batik ambassador challenge for 2018 was to make a Galentine's postcard or mug rug. I had never heard of Galentine's Day before, but apparently it was invented on the show Parks and Recreation, setting February 13th as a day for women to celebrate their female friends. That sounded like fun! I picked one particular friend I wanted to make for, designed something especially for her and then waited for my box to arrive. And waited. And waited. And Galentine's Day came and went and I was still waiting for my box. Darn postal service! At that point, I could have skipped this challenge, since I had missed the deadline anyway and there's a second Island Batik challenge in February. But I really wanted to make this little surprise, so I did. Better late than never, right? Connie is one of the most cheerful, enthusiastic and positive people I know, so this quote seemed to fit her perfectly. And when I saw that yellow in the stash builder rolls in my box, it made me think of sunshine, which I know she's longing for as she's not a fan of winter. The batik I chose for the background has a gorgeous, subtle print that is really hard to capture in a picture. Here are a couple of close ups to give you a glimpse of it. After doing Mom's dragonflies with simple backstitch, I wanted to try it for the letters and I found it worked beautifully. Jenny of Elefantz Designs recommends using tiny stitches to make the smoothest lines and it makes a big difference. 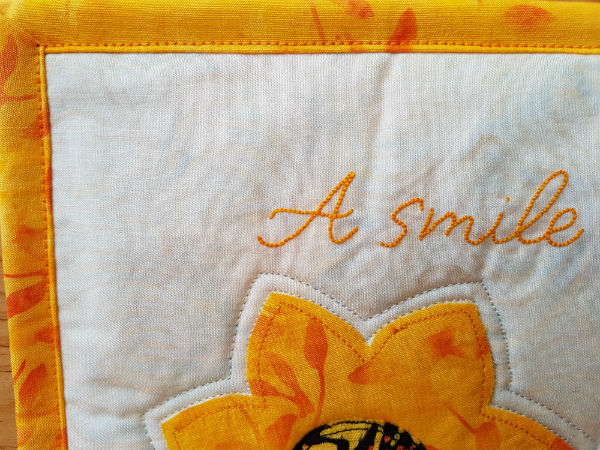 The letters are stitched with Aurifil 12 wt number 2145. 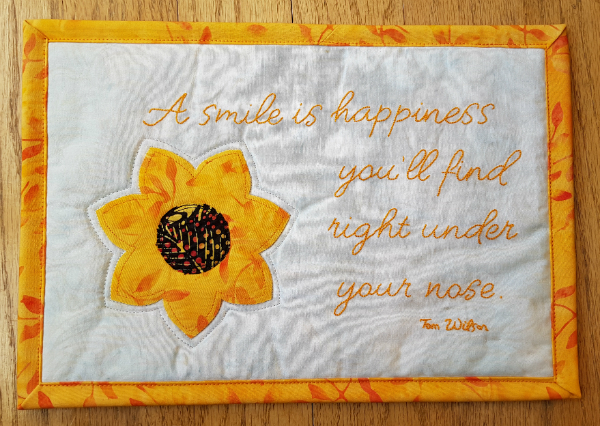 All while I was stitching those letters, I wondered how I would quilt this little mug rug. I knew I'd stitch around the flower and then echo around it, but beyond that I wasn't sure what to do. 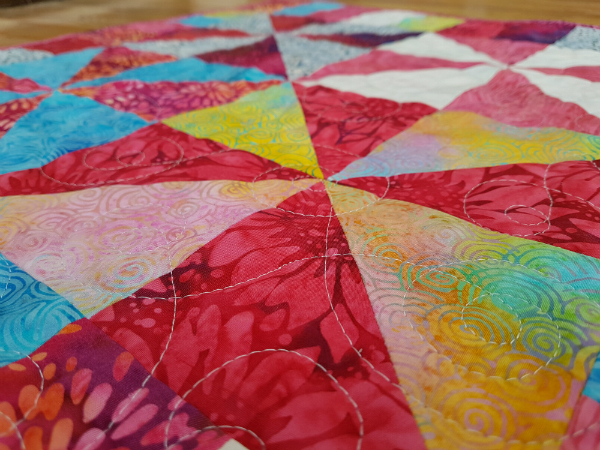 After I had finished quilting the flower (with Aurifil 2600), I sat and stared at it for a few minutes, still pondering. In the end, though, I decided I liked the simplicity of the unquilted background. A quick machine binding with more of that sunshiny yellow and it was done! I decided to mail it to Connie, even though we live only 5 minutes apart, because surprises in the mail are so much fun. And boy, was she ever surprised 😊 Don't you love planning surprises for friends? 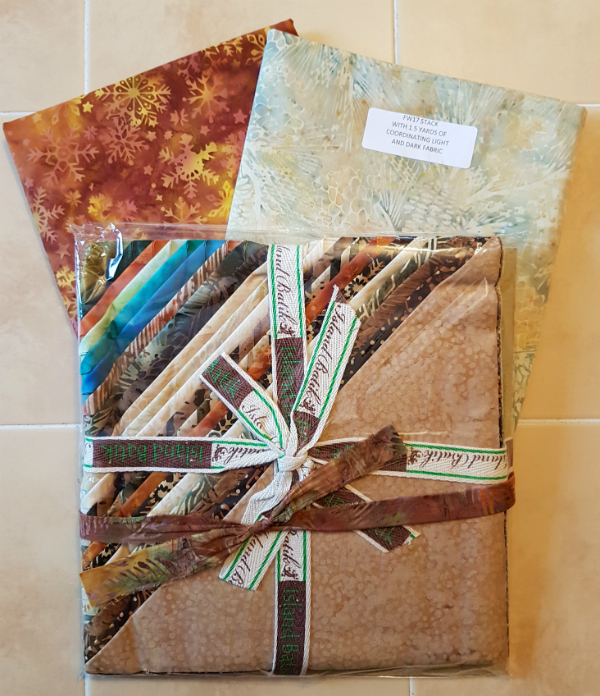 Thank you, Island Batik, for this fun challenge and for the gorgeous fabrics that made it possible. That's one challenge down, 12 more to go, lol. I'll be back next week for the second February challenge, so stay tuned. It's a pretty bright and crazy one! It is fascinating to me to watch my boys grow up and discover the things they are good at and enjoy. Aiden has musical talent that astounds me. He can play drums and guitar, both without formal lessons, and he has started writing his own music. Zachary really enjoys social time with his friends and is developing an interest in school sports, especially now that he's old enough to try out for the senior teams. This year, so far, it has been cross-country running, softball, archery, volleyball and basketball (both the junior and senior teams). And Nathan loves drawing and creating things out of cardboard boxes. It's pretty impressive what he can make out of the cardboard. After watching the Olympics for a couple of days he set out to make a luge track and sled, both of which turned out nicely. I firmly believe that God has given special talents and abilities to everyone. If you've been reading these devotions any length of time then you've probably heard that from me before. 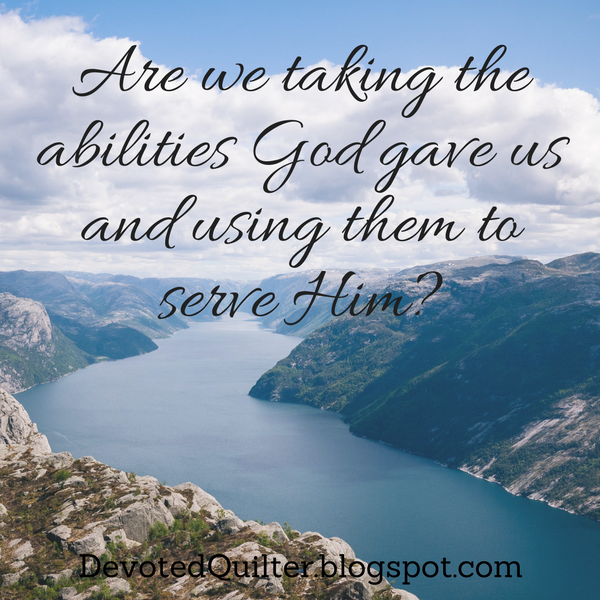 No one was left out when God handed out abilities, and He wants us to use all of those abilities to serve Him. Some people have abilities that are impressive and public, like musicians. Others have abilities that are more behind-the-scenes, like organizers. Neither of the two are more important than the other, but we definitely tend to value the public abilities more than the behind-the-scenes ones. "Again, the Kingdom of Heaven can be illustrated by the story of a man going on a long trip. He called together his servants and entrusted his money to them while he was gone. He gave five bags of silver to one, two bags of silver to another, and one bag of silver to the last—dividing it in proportion to their abilities. He then left on his trip. “The servant who received the five bags of silver began to invest the money and earned five more. The servant with two bags of silver also went to work and earned two more. But the servant who received the one bag of silver dug a hole in the ground and hid the master’s money. As he read, my pastor paused right at the beginning and repeated the phrase, "according to their abilities" and then kept going. That wasn't really important to the point of his message that morning, but it really stuck with me. The three servants were each given a certain amount of money, in proportion to their abilities, as the NLT puts it. The first two used those abilities of theirs to double the amount of money they'd been given. The third servant hid the money, did nothing with it and returned it to his master when he returned. What I find interesting is that the first two servants were given the exact same praise when they returned the money to their master. One had started with 5 bags of silver and returned 10, the other started with 2 bags and returned 4. Yet, even though the first servant gave back 6 whole bags of silver more, he was not rewarded more than the second servant. Looked at another way, the second servant was not chastised for having fewer bags of silver. Why? You would think any master would be happier with the one who made him a bigger profit, wouldn't you? The answer lies in the phrase in proportion to their abilities. They both did the best they could with the abilities they had, for which the master rewarded them equally. Some people have abilities with which they will reach and influence hundreds of thousands of people for God. Think Billy Graham. Think Chris Tomlin. Think A.W. Tozer. Millions of people have been impacted by their abilities. Other people have abilities with which they will reach and influence a few people. Think of a pastor of a small, rural church. Think of a person who works at a women's shelter. Think of a business man who volunteers as the treasurer of his church. The world at large will never know who they are, but that doesn't mean they aren't using their abilities exactly how God wants them to be used. God isn't going to compare the results of my service with your results or with Billy Graham's results. He's only going to compare my results with what my results could have been if I used my abilities. Did I take what He gave me and use it to serve Him? Or was I too scared to step out in faith and use what I'd been given? Did I bury my talents and ignore them, passing them back to God at the end of my life still in their original packaging, so to speak? God is looking for a return on the investment He made in our lives. Are we using that investment to serve Him to the best of our abilitiies? 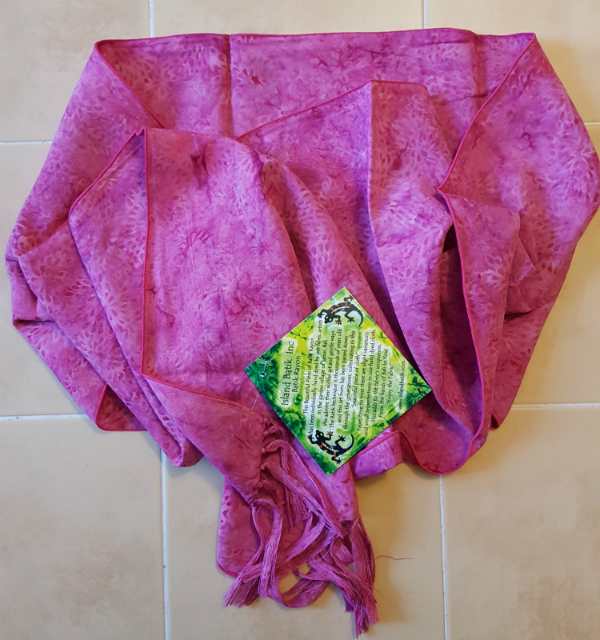 All of the products in this post have been given to my by Island Batik, along with their product partners, Aurifil and Hobbs Batting. Oh, how I've been waiting to share this post! I found out right at the beginning of January that I had been chosen as an ambassador for Island Batik this year. 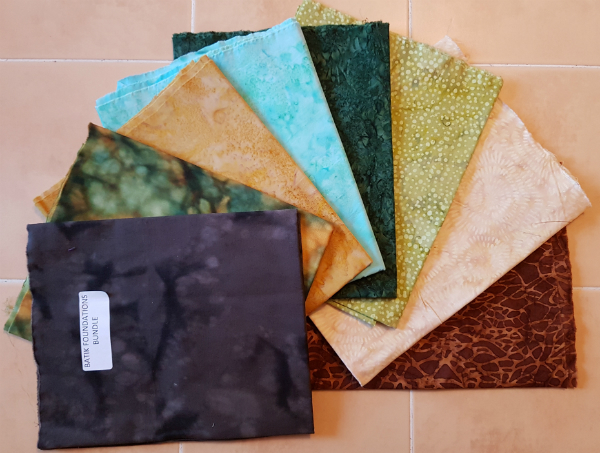 It's my first time being an ambassador and I'm really looking forward to all of the monthly challenges that will give me a chance to play with the gorgeous Island Batik fabrics. Last week all of the ambassadors received notifications that our boxes of goodies had shipped and it has been like waiting for Christmas to arrive. I think having that tracking number might have made me even more anxious as I could check daily (or many times daily 😉) to see if it had moved any closer. Of course, it was all made infinitely worse/better by seeing others open their boxes and share all of the amazing things inside while my own box slooooooly made its way to me. But it's finally here! Let's take a look, shall we? The first thing I saw when I opened the box was a twin-size Hobb's 80/20 batting. That will come in handy, don't you think? I've never used Hobb's before, so I am looking forward to giving it a try. There is also a queen size package of Hobb's Thermore, which is an ultra-thin batting. I have a bag I want to make soon and I want to quilt the panels for it, so I think that's the first thing I'll use this for. The next thing I found in the box is still a secret. It's a bundle of fabrics that will be released at Spring Market, so I can't share them yet. I have peeked, though, and I can tell you they are so, so pretty. I can't wait to get to making with them. In fact, I peeked so quickly, I forgot to take a picture of them still wrapped. Oops! 6 spools of Aurifil thread, including 3 gorgeous greens. 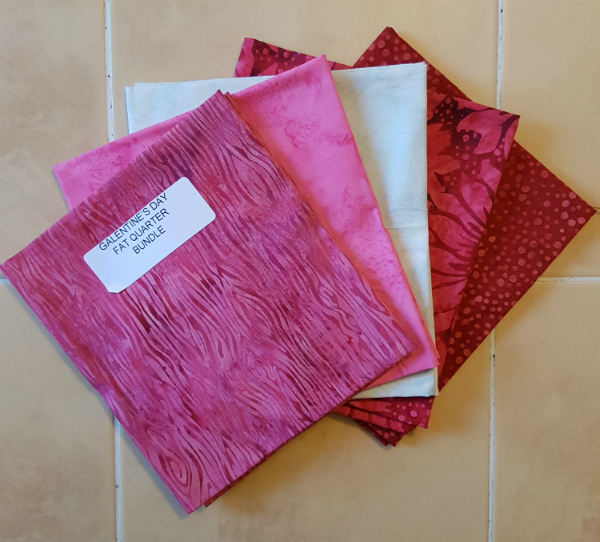 Other ambassadors pointed out that their thread colours match the colours of the secret bundle, so there's a little hint of what my surprise fabrics include. And a whole cone of white. Wow! That will come in handy too. 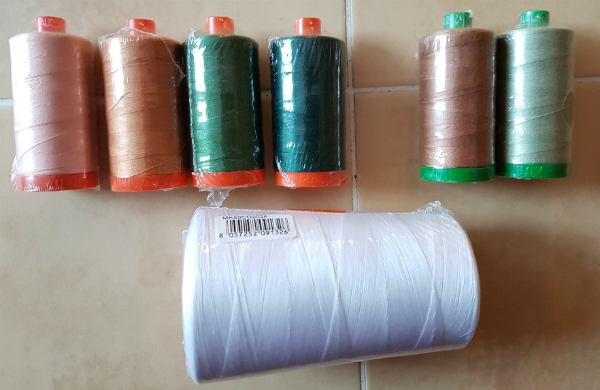 The 2 spools on the right are 40wt, which I haven't used before. Anything I need to know about working with it? Stash builders are 5" x WOF and there are 5 rolls, with 4 fabrics in each roll. Such beautiful colours! That yellow in the middle on the left has already been pulled out to be used for my first project. 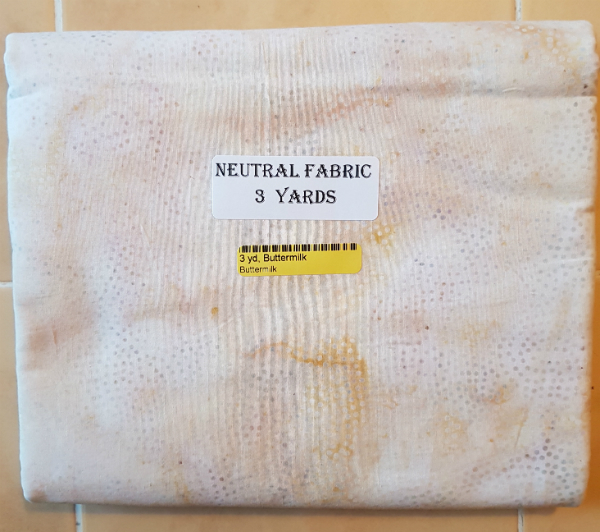 3 yards of a lovely cream neutral fabric. 2 yards of this beautiful rayon. The drape of this is fantastic and I love the colours. I'm thinking it will become a skirt, just as soon as I can decide on a pattern. Maybe the Everyday Skirt by Leisl and Co? Do you have any other suggestions? They also sent a beautiful rayon scarf. Mine is this fabulous bright pink. This fat-eighth bundle is called Elementz and it came with a coordinating orange. I love how bright these ones are. This is a stack of 10" squares of the Northern Woods line, along with 1.5 yards of coordinating light and dark fabrics. I didn't ask for any particular colours because I didn't really know when I filled out the form what I would be using the quilts for, but since then I've come up with some ideas. One of them is a quilt for a man, so I'm really happy to have some more masculine colours included. They also sent this bundle of pinks and reds for a Galentine's Day project. My box didn't arrive in time for Galentine's Day, but I had picked a particular friend I planned to make for, so I'm still going to make it for her. I won't be using the pinks, though, so these will be stashed for some future project. And, last but not least, there was a bundle of Foundations, which are great blender prints. I just finished reading Craig Groeschel's Divine Direction. I have enjoyed all of Groeschel's books that I've read so far and this was no exception. He writes in a simple, easy to understand style, but I find his stories and points make me think deeply about my life and how I'm living. Just consider this, from the chapter on serving: "Instead of just sometimes doing good things in God's name to help other people, consider making a radical shift in thinking. Rather than seeing service as something you occasionally do, what if you saw yourself as a servant? It's not what you do; it's who you are." That thought has been following me around for days! I will admit that 'serving' has always felt like something on my to-do list. It is something I feel I should be doing, and something that I'm aware of when I am doing it, almost to the point of thinking, "I am serving so-and-so right now." I am especially likely to think something along those lines when however I am serving is something I really don't want to be doing! But Groeschel is challenging us to approach serving differently. To take it off the to-do list altogether and embrace it as a part of who we are. In trying to figure out the difference, I thought of this: I hate cleaning. Always have. I clean because it has to be done, but I resist every step of the way. My mother-in-law, on the other hand, genuinely enjoys cleaning. If you are in her home for any length of time you will see her tidying up often, restoring things to their proper places and making sure the house is clean. There is no resistance in her against doing these tasks because she actually enjoys them, a fact which has boggled my mind for as long as I've known her. What if we were to approach serving that way? What if there were no resistance in us, but instead we found genuine joy in doing things for others every chance we had? For one thing, we'd start to look a lot more like Jesus, who "made himself nothing by taking the very nature of a servant, being made in human likeness "(Philippians 2:7). Just think about it - Jesus came to earth as a man to serve God and us by being the perfect sacrifice for sin and so bridging the gap between us. His sole purpose as a man was to serve! What an ideal to strive for. And we should be striving for it. Jesus told us to, in fact, right after giving His disciples an object lesson in serving. He washed their feet, which was usually the job of a servant, and then stood up and said, "Now that I, your Lord and Teacher, have washed your feet, you also should wash one another’s feet. I have set you an example that you should do as I have done for you. Very truly I tell you, no servant is greater than his master, nor is a messenger greater than the one who sent him. Now that you know these things, you will be blessed if you do them" (John 13:14-17). 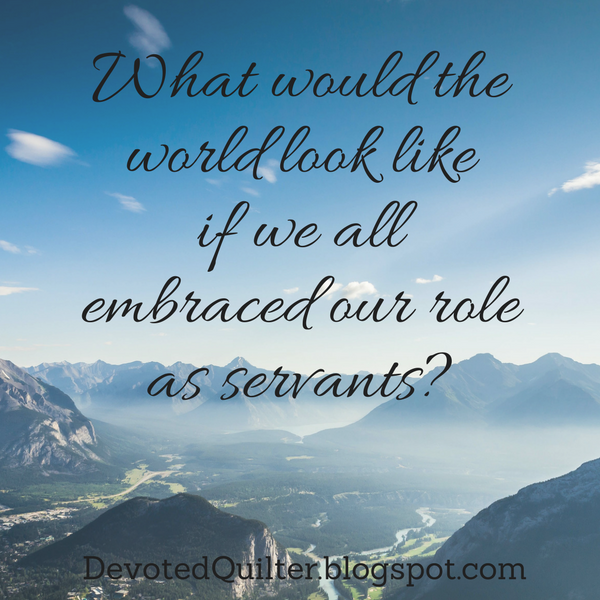 What would the world look like if we all embraced our role as servants? "A farmer went out to sow his seed. As he was scattering the seed, some fell along the path, and the birds came and ate it up. Some fell on rocky places, where it did not have much soil. It sprang up quickly, because the soil was shallow. But when the sun came up, the plants were scorched, and they withered because they had no root. Other seed fell among thorns, which grew up and choked the plants. Still other seed fell on good soil, where it produced a crop—a hundred, sixty or thirty times what was sown. Whoever has ears, let them hear" (Matthew 13:3-9). Here's what struck me as I read it again a couple of weeks ago: that's a lot of seeds planted that never produced anything! I picture this farmer walking along, a bag of seeds slung over his shoulder. Every step or two, he reaches into the bag for a handful of seeds and he swings his hand from side to side as he walks, tossing out a shower of seeds. The story tells us that a lot of those seeds fall where they will never produce anything, but that some of the seeds will produce much more than was originally sown. "When anyone hears the message about the kingdom and does not understand it, the evil one comes and snatches away what was sown in their heart. This is the seed sown along the path. The seed falling on rocky ground refers to someone who hears the word and at once receives it with joy. But since they have no root, they last only a short time. When trouble or persecution comes because of the word, they quickly fall away. The seed falling among the thorns refers to someone who hears the word, but the worries of this life and the deceitfulness of wealth choke the word, making it unfruitful. But the seed falling on good soil refers to someone who hears the word and understands it. This is the one who produces a crop, yielding a hundred, sixty or thirty times what was sown." (vv. 19-23). Whenever I've read the story before, I focused on the people who heard the word of God and how they received it. But this time, I thought more about the person sharing the word. Just like the farmer, that person spreads the word and a lot of the time there is no result. But where there is a result, the payoff is amazing. Think about it this way: everything we do to bring God to people's attention is a seed sown. Much of the time, what we say about God will have little or no lasting impact on the people who hear because their hearts aren't ready to receive Jesus. But sometimes, those who are listening are ready. And in that moment our little seed that we sow can lead to someone accepting Jesus as their Savior and going on to impact the world for God in their own way. That's the crop that is so far beyond what was sown. The thing is, we can't know which of the seeds we sow will produce results. It's not even our job to worry about which seeds will produce. All we have to do is sow as many seeds as possible and leave the rest to God. Of course, we like to see results, don't we? We like to know that the work we're doing is worthwhile. We don't like feeling like we're wasting our time and effort. 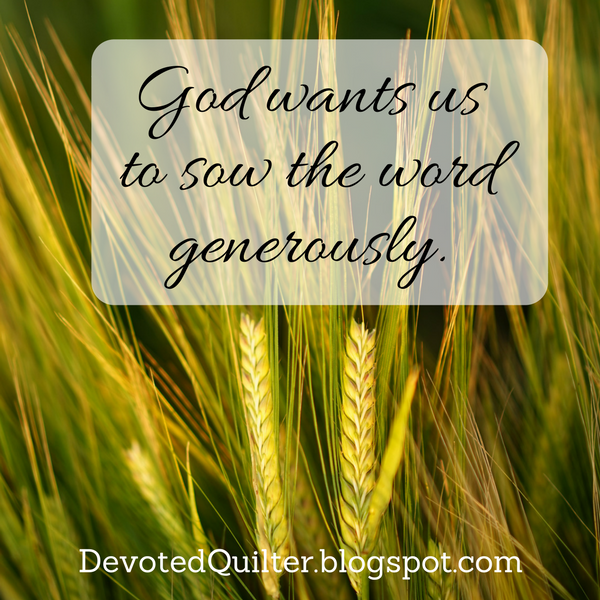 But what this story tells me is that God wants us to sow the word generously, without worrying about what the results will be. That's up to Him, after all. And just as with farming, there's only one guarantee: if you don't sow, you can't reap. If this is your first time here, then an especially big welcome to you 😊 If you like what you see, please subscribe to my monthly newsletter, The Bulletin. On the 16th of each month I share news from here, a family favourite recipe and a themed round-up of fun things to make. 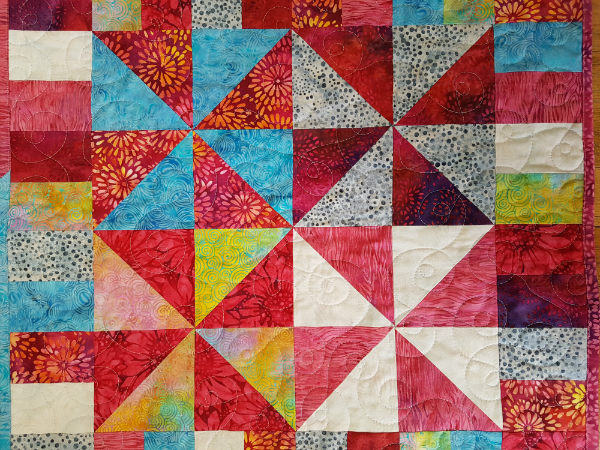 Plus, when you sign up, you get a free copy of my Wind Farm quilt pattern, available exclusively to subscribers. I can honestly say Thank Goodness it's Finally Finished about this project. Back in the fall, I noticed my purse was starting to fray a little in places. I made it back in 2015, and I've used it constantly since then, so it wasn't surprising, really. I looked at the pattern for a couple of months, debating. I even put all the hardware and interfacing in an online cart once, then left it sitting there while I continued debating. Finally, with some encouragement on IG from others who have made it, I ordered the pattern and supplies. Everything arrived last Monday and I spent that evening cutting out pieces and fusing the interfacing in place. Tuesday evening I tackled the hardware (much easier than I thought it would be!) and started assembling the credit card slot pocket. 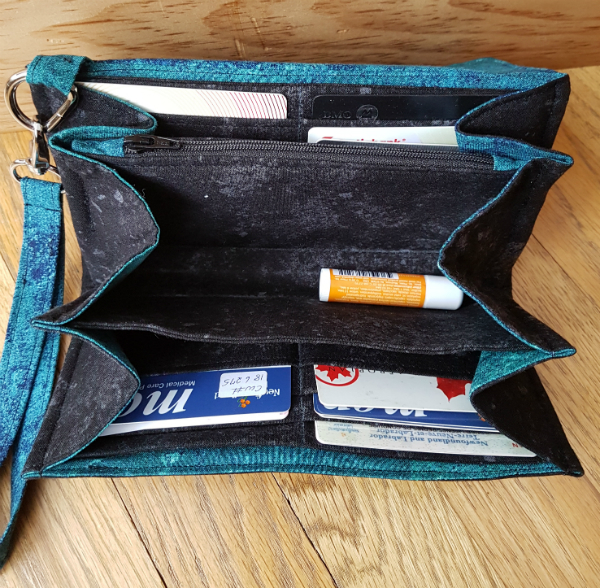 Wednesday morning school had a delayed opening because of icy roads, so I finished the credit card pocket and mostly made the zipper pocket. 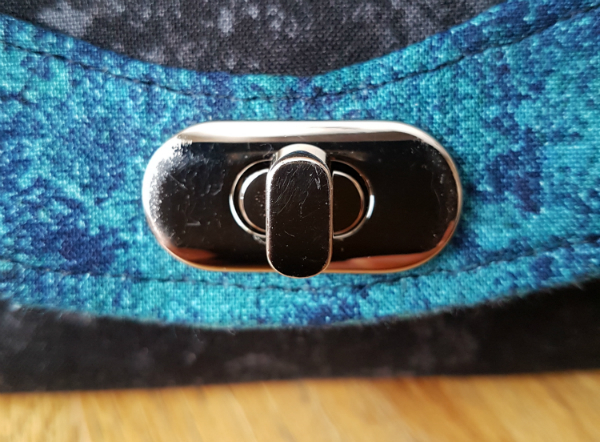 I would have completely made the zipper pocket if I hadn't originally sewn it so the zipper pull would be inside the pocket! 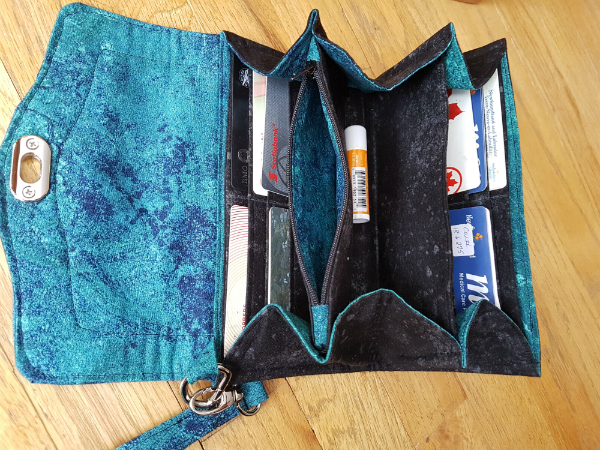 With a stint of naptime sewing that afternoon, I had myself a new wallet! Both the black and teal fabrics are from Northcott and they're both leftovers from a quilt I'll be able to show you soon. I love using the leftovers right away 😊 As with my last purse, I've declared that these colours match everything I will wear between now and when I make myself a new one. I can't be bothered with switching things from one bag to another based on what I'm wearing, so this is it. Here is the inside. As you can see, I carry a lot around with me, lol. That's why I don't need a very big bag! The only things missing are my keys and my phone, which I used to take the pictures. It's hard to tell in these pictures, but at the front and back, behind the credit card slot piece, there's another space. I keep my phone in the one at the back and cash in the one at the front. Well, I will if I ever carry cash. Who carries cash anymore? And here it is again, this time with the pocket open. I was so impressed with how easily it came together. My sewing machine didn't like all of the layers when I sewed the sides near the zipper, but other than that I had no issues. The pattern is so well written and everything comes together perfectly. It was a lot faster than I expected too, and would be even faster next time since I'd be familiar with all the steps and the hardware. I can see why people end up making a lot of these 😊 I'm already thinking that if I make another one I may try the variation with two zippers. If you're looking for a new wallet, I would definitely recommend this one. I love carrying this around town! 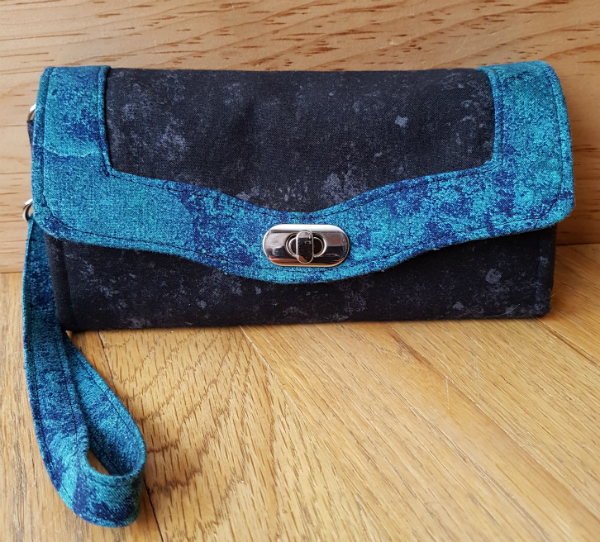 Do you carry a handmade purse? And now it's your turn. What did you finish this week? Link it up here, then be sure to check out some of the other links and celebrate their finishes too.